Experience a journey where food and wine converge in the heart of Italy. Spend seven stunning days based out of Ascoli Piceno, located just around the corner from Rome. Traverse across hills covered in vineyards while sipping organic wines and getting to know many of the award-winning vintners of our region. Slow down, embrace the diverse beauty of this territory, and drink up a little of Italy’s “La Dolce Vita”. Step inside some of Italy’s most prized wineries and indulge in local delicacies. Of course, no trip to Italy would be complete without enjoying fantastic food and learning a few cooking secrets along the way. Dive into hands-on cooking classes led by a locally renowned chef and professional sommelier. And to top it all off your trip will be expertly led by a Fully-bilingual, 100% Italian, 100% local guide with an International culinary resume. Come to the “Otherside” of Italy and experience the authentic Italian wine vacation that you have been craving. 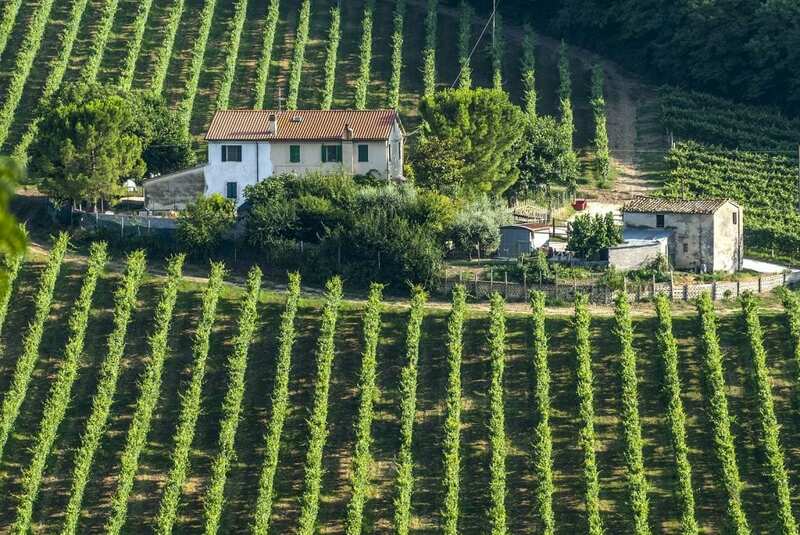 * Tap into the local scene while experiencing two of Italy’s prized wine regions. * Meet the maker. Come face-to-face with the people who produce the wine and experience their undeniable passion first hand. * Taste award winning varietals while traversing the wine-soaked medieval villages of lesser-known Italy. * Indulge in wine and dishes that are fresh, local & organic – the original Slow Food or Slow Drink – at its finest. * Stand on top of the largest medieval fortress in Italy and experience 360 degree views of ancient olive groves & vineyards lined with Montepulciano grapes. * Enter a local family-run wine estate and learn the story of centuries old wine making tradition. Meet up in Rome and travel across one of Italy’s beautiful national parks to reach Ascoli Piceno. Tonight, at dinner get to know your fellow travellers and learn about the exciting week ahead. Ease into Italian life as we make our way to wine country and enjoy a morning stroll through one of Italy’s most beautiful medieval villages. For Lunch we will make our way to the vineyard of the original pecorino vine. Today we will feast on zero-km cuisine while we wash it all now with local award winning wines. Today get to know Ascoli Piceno and its beautiful Renaissance squares with our local guide and expert of the area. Lunch in the heart of truffle country at one of our favourite local family-run establishments known for its fresh, local, and traditional cuisine. And if you are lucky you might even taste Nonna’shandmade Olive all’ascolana (stuffed olives). Today your guide will whisk you away into the Italian countryside for a cooking class at a 17th century villa. Your instructor will take you on a culinary journey using fresh ingredients grown onsite or nearby the Agriturismo (farm-stay). For lunch enjoy the fruits of your labour and relax by the poolside before returning to Ascoli in the late afternoon. This morning’s jaunt will take us to Loreto, a beautiful basilica nearby the sea. Experience the breathtaking Renaissance masterpieces located at this pilgrimage site. Travel down to the blue coast for a seafood lunch by the seaside. Relax like a local with an evening walk through Ascoli’s breathtaking city squares. Today we will head towards the region of Abruzzo, making our way to Italy’s largest medieval fortress. Feel as though you entered into your own Game of Thrones episode as we explore the streets within this walled city. After we will delve deeper into Abruzzo and dine at a local restaurant known for its Slow Food and rustically refined dishes. After breakfast bid farewell to Ascoli before being driven to the bus or train station. Arriverderci! Travel to and from Italy, travel insurance, any other meals not noted in the itinerary, and excursions not listed above.